This mysterious trio have arisen from the legends of Lyon to strike terror into our beating hearts. Their style is a harsh occult-minded dark synthwave, masterfully infused with black metal and classical/orchestral elements. They are potential pioneers of a so-called “blackwave” music style, which is set to grow and expand in this scene. Synthwave has never sounded this visceral and black before.This interview will shed light on these dark and twisted souls that hail from the mythical Magonia! This arcane land is often whispered about, but no-one knows whether the rumours and the tales are true. They are Magonia, and through hailstorms and tempests, they’re about to unleash the apocalypse upon the people of this Earth. RETROWAVER: Welcome guys! Greetings from Russia and thanks for your time for this interview! First things first, can you introduce yourselves? 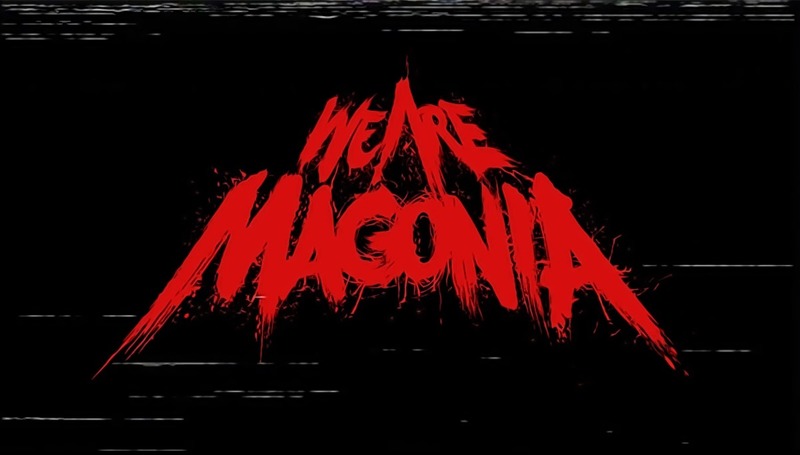 We Are Magonia: Hi, our name is We Are Magonia, and we are an electronic music band from Lyon, France! What’s the origin of the name of your band and what was an idea behind it? Magonia was the name of a land where Aliens came from, and the bishop Agobard reported sightings of them in Lyon around 800 A.D.
That’s a very cool and unique source of inspiration! There are 3 of you in the band. Do you all have different roles? All 3 of us take part in the writing process, and it usually comes together in one direction. However, each one of us brings something different which makes the writing process complete. We have to find the melodies, rhythms and guitar parts. Make the different elements work together during mixing and mastering, and tweaking knobs on a synth to have the perfect sound! That’s why we all have to work together on the different tasks to achieve a more complete song. How long have you known each other? Can you recall the moment when you all thought you could be in a band together? We have known each other for something like a decade, and we’ve been making music together since then on various projects. We Are Magonia is the project that gathered us around a collective desire to write something influenced by electronic and metal music. I’m interested to know more about some of your other projects. Can you tell me a bit about these? So, one of us is a film director and soundtrack music composer. We also have a Black metal/Deathcore guitar player and a former hip-hop Beatmaker. The French synthwave scene is vast and impressive. We got to hear that on “French Synthwave Compilation Vol. 1” by LRV Records. Tell us about your relationships with other synthwave composers from France? Do you have any good friends who helped you with your debut record? We’re not involved very much in the social part of the scene. However, we had a lot of help from guys like Funeral Director and Maraudeur who gave us a lot of feedback on our work, which is very much appreciated and helpful! We also had some support from The 80’s Guy who posted our first release “Terror” on his YouTube channel. Have you ever performed live with We Are Magonia? Not yet, but we can’t wait to do it! Do you have any plans for the appearance of your live shows, like wearing masks, displaying imagery or something else? How do you spend your leisure time when not making music? Ok, let’s speak about your new release. Firstly, I would like to congratulate you on your debut album which will be released at 6 o’clock on the 6th day of the 6th month! How does it feel to know that your creation is about to go out into the world? We can’t wait to hear how people react to it. It’s a debut album, so we’re a bit anxious about it. We hope people will like it, and we’re curious to see which track will be the favourite with our listeners. How long did it take to create the album? We released our first track “Terror” 7 months ago and started to write what would become the album at the same time. It took us 6 months to write. 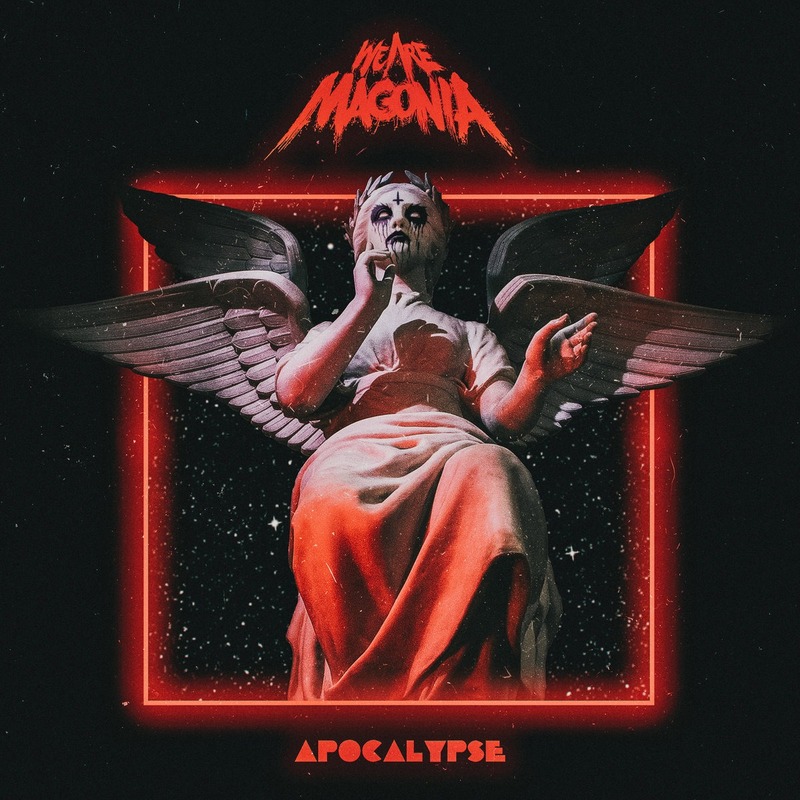 Your album has a big name – APOCALYPSE! Can you give us the backstory behind it? “Apocalypse” was the first word that came to us on the day we sat in the studio and listened to the finished songs. Not that we mean it biblically, but more like a feeling we all had… Also, it was funny to name our debut album after what is supposed to be the end of time! The next one will be “See you in Hell” hahaha. Who did the cover art for your album? What is this statue on the cover? We made the cover ourselves, and just like our name Magonia, which comes from the legends of Lyon, this statue is also connected to our city. How would you describe your music? Who are your major musical influences? We all come from different, but always violent or dark genres like metal or dirty hip-hop. Hence the distorted aspect of some of the tracks. Classical/Baroque music was also some kind of influence, as well as all the French 70s and 80s pop music artists such as Jean Jacques Goldman, Daniel Balavoine and Jean Michel Jarre. And even if we don’t really listen to it, as Frenchies we grew up hearing bands like Justice and Daft Punk, who could also be some subconscious influences. Did you have any difficulties or problems whilst writing the album? There were no major troubles with it. The mastering process was a little difficult because some of the tracks sounded different than others, and on one of the tracks we had to master about fifteen different versions to try and fit the album. That’s dedication! Can you tell us a bit about your songwriting process? Was there one particular track that you remember having to put a lot of work into? The track we remember working on the most was “Primal Scream”. Tweaking / patching the modular synth until we found something that we were happy with, and getting it to sound as close as possible to a real human scream. I saw the term “Blackwave” used to describe your music on your Bandcamp page. Can you tell me something about it? It’s a kind of mixing between black metal elements and synthesiser music. Even if musically some artists already combined this genre, we think it’s cool to put a name on it. I noticed some awesome toys on your Instagram, like Prophet-6, Arturia Microbrute with Modular Synth and Schecter guitars. What other equipment are you using when making music? And the same goes for software. What VST’s do you use to help you produce such a “Darksynth” sound? We actually use every piece that you mentioned, alongside other ones (PolySix, Modular synth, Roland JX-8P, Ensoniq EPS) and basic VSTs like 3OSC, or a few digital replicas of classic analog synths. The difference is more how we use them and the process itself. Utilizing a VST is more direct, and you can write things more efficiently, but it’s less practical when you have to tweak the sound. On the other side, a real piece of analog gear will be entertaining to play with and find the exact music you’re looking for (not to mention the nostalgic aspect of the sound itself), but it will be a little more time-consuming. As for the guitars, the parts that have been recorded were played on Schecter guitars (Pt-Fastback, Demon-7 and Hellraiser Hybrid-7) and used Bareknuckles and EMG pickups. There is one track on your album named “August 29, 1997” that you recorded together with Serbian composer Isidor. How did that come about and what was Isidor’s role in the recording process? We were experiencing a lack of inspiration on a track we dug out from some old projects… Speaking with Isidor about it we agreed on sending him the record to see if he could come up with some ideas. He sent us back the project with some of his ideas on it, and it basically allowed us to finish the song! Now I have to ask which synthwave composers you would like to collaborate with in the future? And what about vocals? Do you have some plans to add vocals on your future releases? Is there any particular vocalist you would like to hear on your tracks? The project is very young for now, and we still need to find where we really want to go. For now we don’t need vocals, nor do we need a vocalist, but nothing is fixed. It seems like you were inspired by horror movies while writing the album. Can you tell me which ones? The truth is, only one of us really watched horror movies as a kid. The other two of us were too scared and were more into action movies! But we’d guess we were all subconsciously inspired by classical 80’s slashers and cinesploitation that were broadcasted on our old cathodic TV when our parents were out! At the moment your tracks are quite horror influenced. Do you think this might change on future releases? Horror is a theme we like for now, but nothing is fixed in time. We feel that art should always be evolving, otherwise it becomes boring! Oh, and if we wanted to make 15 times the same album about the same themes we should have called ourselves AC/DC or Iron Maiden hahaha! Yes! Someone found it and sent it to us! We laughed really hard, and this is really funny! But more generally, people’s reactions to our music are very positive, and we have a lot of positive feedback from a lot of different countries so it’s very encouraging for us!!! If you hadn’t become musicians, what do you think you would be doing right now? Probably what we already do when we’re not composing! Photography, video, artistic designs etc… Luckily we have these other abilities that allow us to fully DIY our musical and visual creations. I’d be excited to hear your opinion about the “darksynth” genre in general. Well, darksynth as a genre is still quite young, but we hope that in the future there will be a turnaround as it was in the evolution of rock and roll. In the beginning, a softer rock was played. Then we saw the first heavy metal band coming, and at first people were a little shocked by it. There were a really small amount of heavy bands compared to softer rock. Then later the style became bigger and bigger. We hope that the same will happen with darksynth. We would like to see it go from being considered a sub-genre of synthwave to becoming a separate genre. For example, death metal is not a subgenre of rock and roll anymore. Just like Preston Cram wrote recently in his article on Iron Skullet, “Darksynth deserves its own genre”. Exactly. Like how metal became its own genre. I think it’s just a matter of time. Darksynth has become more complex and will continue to develop more and more. You are right. We also think the same as you, and we want more acts, blogs, artists and channels. Anything that can help the scene to grow bigger. Do you have any advice for synthwave newcomers? Do it as you feel it, don’t try to be too synthwavish. Listen to other kinds of music and mix it with synthwave. We have tons of tracks lately all sounding very similar, and we think we don’t need more. What we do need is crossover tracks with 80’s elements, but also with elements from other styles. Production techniques have changed, and it opens a whole lot of possibilities. It would be sad not to use it to give our vision of music. What’s next for We Are Magonia? What’s your ultimate direction for the band? Well, thank you guys for this excellent interview! It was exciting to learn more about you. Do you have any last words for your fans? Thanks for supporting us, and we hope to see everybody on the road! Thanks again. I sincerely wish you further success in the future! Have a great time guys!